I'm not really "into" Christmas. I know some people who put up their tree immediately after Thanksgiving (if not the week before) and start listening to holiday music around Halloween. It's not my thing, but if it's yours, rock on with your bad self. My holiday of choice is Valentine's Day, and my house looks like a 2nd grade classroom for the month of February, so I really can't judge. Despite my general apathy about Christmas, I decided to head to Urban Orchid's holiday open house this past weekend. 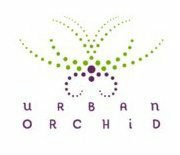 Owned by my friend Brandon, The Urban Orchid is a relatively new gift and floral shop in Ohio City. As I'd read on The Urban Orchid's Facebook page, the event promised wine and cupcakes, so how could I possibly pass that up? When I got to Urban Orchid, I was so happy that I'd made the trek from the east side. Although the store has been open for a few months, I haven't had a chance to stop by. (athough I have ordered a couple of really nice floral arrangements) I'm not sure that I can put into words how adorable the store is. Urban Orchid carries everything from vintage Christmas ornaments, to handmade jewelry, to candles, to baby clothes, and everything in between. It's sounds like a crazy mish mosh of things, but Brandon has done an excellent job of selecting really unique pieces to carry in his store in addition to traditional floral arrangements. As an added bonus, many of the products in the store are made by local artists. I'm all about shopping local these days, and seeing all of the holiday decor in Urban Orchid really put me in the holiday spirit. I was able to pick up a couple really unique ornaments and handmade gift cards for an upcoming holiday brunch that I go to with a couple of my friends from work every year. Now all I want to do is decorate my house and do more shopping! But that might have to wait until next payday. P.S. This is not a paid post. I really believe in my friend's business and shopping locally and hope that other people will chose to shop locally this holiday season. Freshwater Cleveland posted a list of local pop-up shops. http://www.freshwatercleveland.com/features/holidaypopupshops120111.aspx I'm looking forward to checking out Collective Upcycle. What a fun giveaway!! Well, since I just moved back, I don't have that many ideas. However, I love Cafe Ah-Roma which is a cafe, but a LOCAL chain! I go there often for lunch. Their ingredients are always so fresh and the people are so nice. Nikki - you're my winner! Please email me your contact info at CLE.vegetarians.taste.better at gmail dot com.